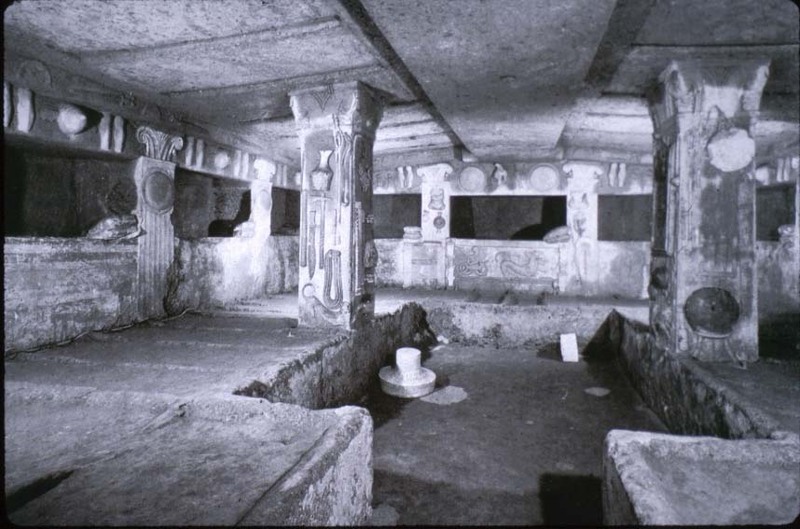 "Crossing the threshold of the cemetery, each of them [the Etruscans of Cerveteri] possessed a second house." "Inside this house, a resting place was already prepared. And soon, they would be lying down alongside their forefathers." "Eternity, therefore, was not a vague illusion. Nor a mere fairy tale. Nor an insubstantial promise by their priests." 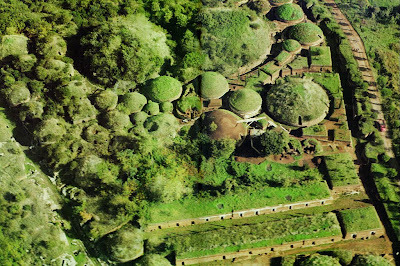 showing rounded tumuli, above, and rectilinear chamber tombs, below. We walk along the streets of this seeming city - popping in and out of tombs. Like casual calls on friends and neighbors, on a pleasant holiday when everyone is home. 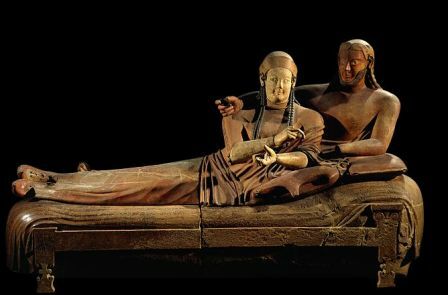 We can reach out and touch the Etruscan afterlife - or so we like to think. But this is a laughable impertinence on our part. The perennial license of the living to play fast and loose with the dead. is seen at the right, in deep shadow. But...the incredible concreteness of it all! For once, the Mysterious Etruscans seem diagrammatically clear. The by-ways of Cerveteri are combed with simple holes in the rock; the most rudimentary of resting places. We think of squatters in cardboard boxes on modern city streets. A minimal burial site is seen at the lower left. Broad avenues are lined with rows of rectilinear tombs, boasting fine facades of dressed stone. bold foundation courses and elaborate moldings at the roof line. Inside, we see chambers hewn with elegant precision from the native rock. were indicated by semi-circular disks. Inside the tumulus of the noble Matuna family. ...lavishly decorated with the appurtenances of aristocratic life. But who were the people buried here? in the Villa Giulia Museum in Rome. 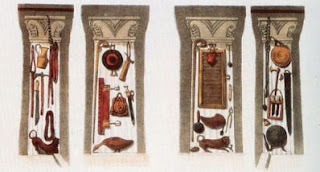 We hear that Etruscan society was rigidly hierarchical - and this is the seeming proof. Dominated by the elegant and self-possessed individuals who smile at us from frescoes and sarcophagus lids. Re-enacting the pleasures of their privileged lives. At Cerveteri, we see free-standing mansions, comfortable row houses...and mere holes in the ground. But this is a tourist trick that we play on ourselves - reducing history to urban real estate. In the course of five hundred years (from the Eighth through the Fourth Centuries B.C. ), there were periods of greater and lesser wealth and power, evolving social customs and emerging religious beliefs. And all of these forces shaped the local topography. 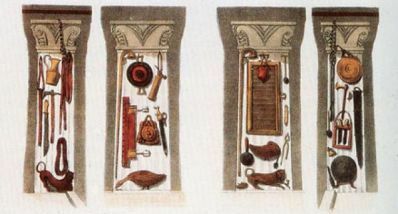 at the left; chamber tombs, at the right. So, the Etruscans of Cerveteri remain as mysterious as we want them to be. at the left, a wall of cut stone. And then we climb back in our cars and drive away - after the inevitable stand-off between the living and the dead. 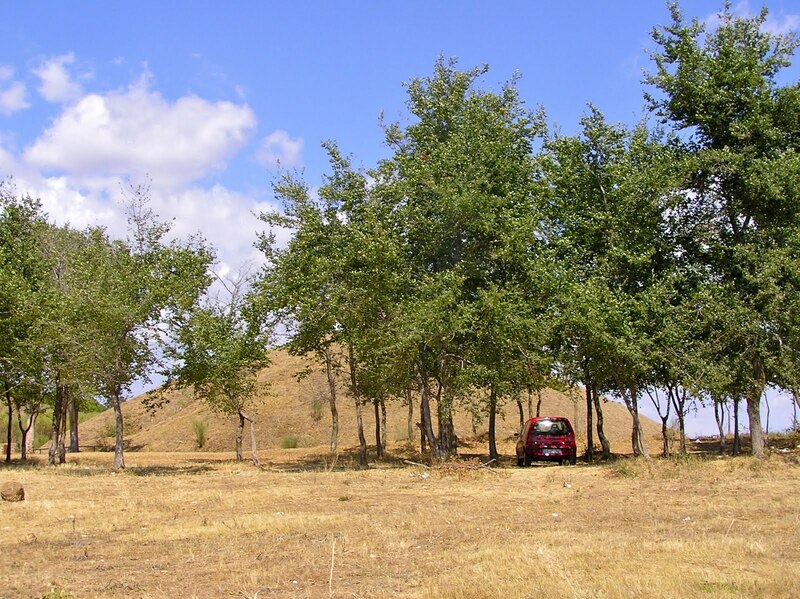 massive tumulus outside the main archeological zone. This is amazing! I just enjoyed every word, every description and every photo. I find it very interesting how social heirarchies seem to be the plague of human nature ~ our complete inability to live harmoniously equal, without pretension. Human nature, I suppose is what makes us human -and also, what makes history both wonderful and horrible. I am sure that Oscar Wilde would have had a quick comeback about the sheer unattractiveness of "living without pretension", but he never seems to be around when you need him! I agree ~ for me the most alluring aspect of history is the study of human nature and its seemingly consistent, predictable behavior and reactions, despite cultural differences, time or "modernity." I have to admit, I had to do some research on Oscar Wilde, after your previous statement ~ what an interesting character ~ you have given me a new subject to study!! Thanks very much for your pictures and descriptive narrative. My wife and I were in Cerveteri in 2006, and we were enthralled by all things Etruscan. Facinating. 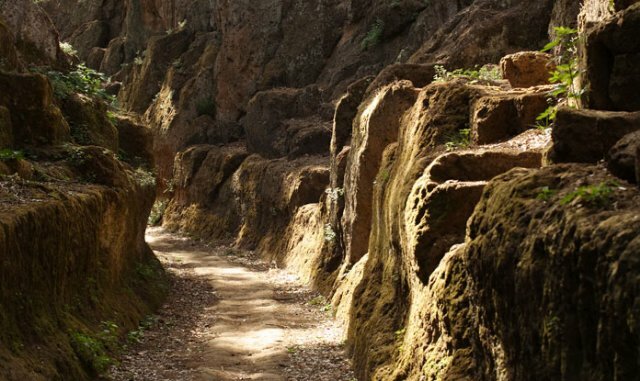 I have visited a lot of Etruscan sites in the course of my many years in Florence but Cerveteri really does have a unique presence.